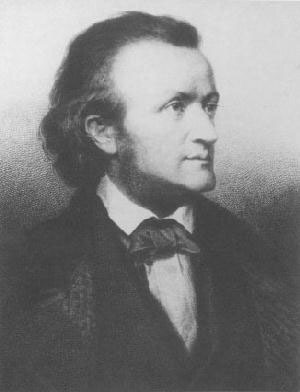 (Wilhelm) Richard Wagner German romantic composer noted chiefly for his invention of the music drama. His cycle of four such dramas The Ring of the Nibelung was produced at his own theatre in Bayreuth in 1876. His other operas include Tanhäuser (1845 revised 1861), Tristan and Isolde (1865), and Parsifal (1882). Wagner certainly advocated vegetarianism, at least for the last few years of his life, but for how long, and to what extent he attempted it himself is less clear.
. . . correspondence Ellis reveals he had already had with "a lady who had most intimately known the composer for the last thirty years of his life". He quotes a passage from this lady's reply on the subject of vegetarianism and Buddhism: Wagner was "in principle" a vegetarian, she says, but "in practice, however, neither his health nor the orders of his physician allowed him to be a vegetarian." We also have a very similar comment from Lilli Lehmann, about her dinner with Wagner in 1875, though written many years later. See below. His closest living relative, Winifred Wagner, widow of his son Sigfried, explained during our interview in February 1972 that Wagner would have liked to have been a vegetarian for ethical reasons, but his poor health prevented him from changing his diet: he suffered from a weak heart and eczema of the face, gesichstrose. It should be noted that Winifred did not know Wagner personally as she was born 16 years after he died, so this must be from other family memories - most likely again from Cosima who was Winifred's mother-in-law for 15 years from 1915-1930. There are some references to Wagner and his first wife, Minna, visiting Hydropathic (water cure) sanitariums in the 1850s when they were in exile in Zurich. These were usually completely vegetarian at that time and Wagner apparently made various attempts to apply the principles to his daily life, but with his typical extreme inconsistency, frequently changing his mind about the best version, then giving up. In 1854 Wagner was introduced to the works of the philosopher Arthur Schopenhauer, which he would later call this the most important event of his life. Schopenhauer was never a vegetarian, but did have a great deal to say about the treatment of animals - especially in The Basis of Morality (PDF 25mb) first published in 1840. We also have examples of his concern for animals during this time, such as letter to Minna after he visited London Zoo - saying how much he appreciated her love of animals as well. Though none of this stopped him from eating or wearing them - or visiting zoos. Coffee with Prof. Nietzsche; unfortunately he vexes R.[Richard] very much with an oath he has sworn not to eat meat, but only vegetables. R. considers this nonsense, arrogance as well, and when the Prof. says it is morally important not to eat animals, etc., R. replies that our whole existence is a compromise, which we can only expiate by producing some good. One cannot do that just by drinking milk—better, then, to become an ascetic. To do good in our climate we need good nourishment, and so on. Since the Prof. admits that Richard is right, yet nevertheless sticks to his abstinence, R. becomes angry. In late 1874 Cosima Wagner wrote to Nietzsche congratulating him on his book about Schopenhauer, including: "your wonderful picture of the relationship existing between animals and men" (p.231 of the above correspondence). There seemed to be some convergence of thinking at this point. We stayed to a meal with the Wagners, during which he talked much about vegetarianism that he wanted to adopt entirely, but his physician was opposed to it. After what I know of it to-day from my own experience, I am certain that Wagner, without going to the extremes of vegetarianism, would have found it a means of lengthening his life. [Lilli became vegetarian herself some years later]. By 1879 Wagner's ideas seem to have progressed further and he was actively supporting an anti-vivisection group in Dresden. Religion and Art - full text which originally appeared in the Bayreuther Blätter for October 1880, constituting the whole of that number of the journal. After Wagner's letter to Ernst von Weber about vivisection in 1879, Cosima recorded his concern that this would be seen as the basis for Parsifal, but if McGee is right then the concern was clearly much deeper and much older. You, huntsmen, be on your way! Hoho, blast loudly your horn! O see, how tired is the beast! Set to! The arrow, it flies! See how it flies! My aim was good! But see, the beast can weep! A tear is glistening in its eye! With broken glance it looks at me! Where gentle peace enfolded you? Greeting you, friendly and tame. From their branches, what warbled the birds to you? What harm did the faithful swan? Here, see here! You pierced him here. His snowy plumage crimson defaced. Quite broken his glance - look at his eyes! Now does your evil action haunt you? Cosima's diaries bear frequent witness to the whole family's involvement with the animal world. It must be acknowledged that Wagner's well-known anti-semitism adds to the difficulties we have in considering his views on anything else. However, even this is difficult to untangle - in 1850 he wrote a leaflet on 'Judaism in Music' primarily attacking Mendelssohn and Meyerbeer and expressing his dislike of their music, but by the time of Wagner advocating vegetarianism in 1880 a group admirers in Vienna, who were soon vegetarian following his influence, included the Jewish composer Mahler. We also have a claim that Wagner forced vegetarianism on his followers, the singer Lilli Lehmann being quoted as an example of this (see note), she sang in the first Bayreuth festival, in 1876, and became a major Wagnerian singer. However we now have an interview with Ms. Lehmann from 1907 in which she states she had been vegetarian for five years, ie: from 1902 - not until almost 20 years after Wagner's death. It is also worth noting that, according to her biographers, Lilli Lehmann's mother was Jewish, and that not long before joining Wagner she had appeared in a Meyerbeer opera. You said in your letter you would like to be able to feel kindly towards Wagner. That you can and that you shall! He is the best and noblest of men . . . As for his campaign against 'Judaism' - so he calls it - in music and in modern literature, his motives are entirely high-minded. He is not stupidly anti-Jewish, like the landed gentry or like some protestant churls. You can tell by the way he treats me and by the way he treats Joseph Rubinstein. As for poor Tausig, he was his intimate friend whom he loved very dearly. Richard says there is nobody as stupid as the French. He has come to loathe them more and more (1882). . . . We decide to make our way to Abetone. But on the journey Richard gets so angry with the green mountains, and also with the bare mountains (1880) . . . During lunch he becomes very irritated and takes offence at the flies (1880). . . The Austrian Emporer's uniform annoys him (1881) . . . Richard also disapproves of the weather (1881) . . . Richard returns from his walk, infuriated by the marching music he had just heard (1881). Wagner was not a Schopenhauerite every day in the week, nor even a Wagnerite. His mind changes as often as his mood. . . . Wagner can be quoted against himself almost without limit, much as Beethoven's adagios could be quoted against his scherzos if a dispute arose between two fools as to whether he was a melancholy man or a merry one. - his concern for animals seems to have been strengthened during this time after the hunting incident mentioned above in 1832, though he did not yet appear to have any interest in vegetarianism. However, Dresden is of some significance for IVU as the venue of the first Congress in 1908, and the Centenary in 2008. Note: The claim about Lilli Lehmann originates from 'The Vegetable Passion' by Janet Barkas (now Jan Yager), published in New York, 1975. See page 103 of the paperback edition. The claim that Wagner forced his followers to go vegetarian is unsubstantiated apart from the incorrect claim about Lilli Lehmann.